Working in a safe and well-organized workshop is any DIYers ultimate dream. With the best air hose reels, this dream easily becomes a reality since air hose reels are known for their capacity to maintain safety and organization in any workspace. After hours of research we settled on 5 of the best options you will find in the market so be sure to check them out. What is the Best Air Hose Reel in April, 2019? Goodyear 27517152G 300 50Ft Steel Check price! Goodyear 27527153G 300 50Ft Polypropylene Check price! ReelWorks 27807153A 300 50Ft Polypropylene Check price! Lincoln Lubrication 83753 300 50Ft Steel Check price! Goplus GP-101040140 300 25Ft Steel Check price! Peace of mind and durability is what Goodyear brings forth with the Goodyear 27517152G Air Hose Reel. It a solid pick for auto shop owners who are in need of a multifunctional retractable extension cord reel that they can use for air, oil water and welding. 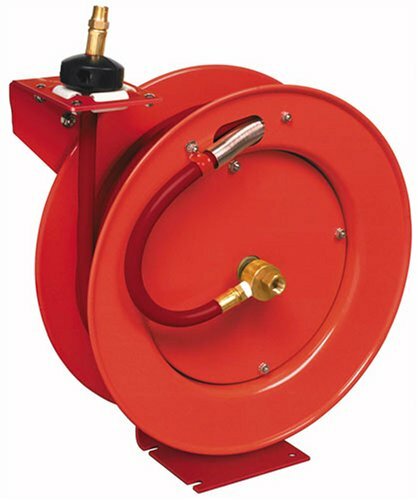 With the trusted quality of Goodyear’s brand that has existed since the 1800’s this air hose reel is long and flexible enough to be used in a variety of situations around the shop. It comes with a newly designed swivel that prevents leakage plus it boasts of an improved ratcheting system that locks the hose at any length you desire. There is more. This hose reel is made with impact resistant polypropylene that is durable. Plus, mounting this air hose reel works like a piece of cake thanks to a bracket that is included in the package and the retracting system also does a smooth job with zero problems. Whether you want to work with a water sprayer or an air compressor, this air hose reel does the job as expected thanks to a bunch of features such as an auto guide rewind system that gives you smooth retractions. A good number of users report of its quality construct even after years of use which is great. In fact, even if you want to add to the hose’s length you don’t have to replace it, just add it to the hose in existence and you are good to go. GOODYEAR Air Hose Reel Heavy Duty Retractable Air Compressor Max. 300PSI, 3/8" or 1/4 INCH x 50FT/ 65FT, Intradin China (Shanghai) Ltd.
You must have already guessed it by now. 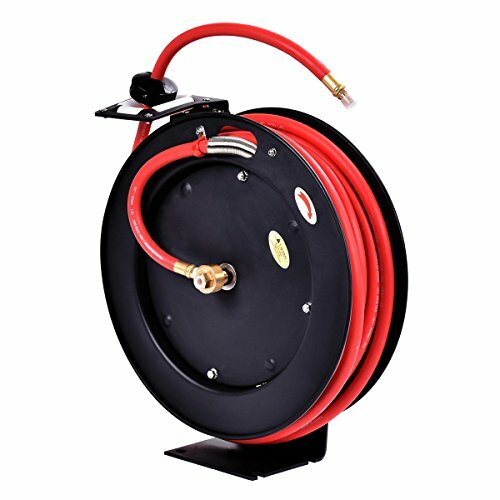 Goodyear has cornered the market when it comes to making quality air hose reels and that is why we had to feature another one of their products on our list. With the Goodyear 27527153G, though at a slightly higher price, comes a hose with a bend designed to eliminate memory, therefore, eliminating chances of kinks forming during retraction. Since it’s a top quality air hose reel, you can expect it to operate in temperatures as low as -400C meaning you don’t have to stop working on your DIY project just because winter has arrived. The locking mechanism on this hose reel will automatically lock the hose real at the length you desire giving this air hose reel the much-needed abrasion and endurance. If you are a pro with a busy workshop, this air hose reel will make your work super easy. Already there are a good number of happy users who remark about its quality construct, durability and functionality. Basically, whether you are only looking to fill up your tires or looking to work with air ratchets, this here is one of the best options even though it is slightly expensive. 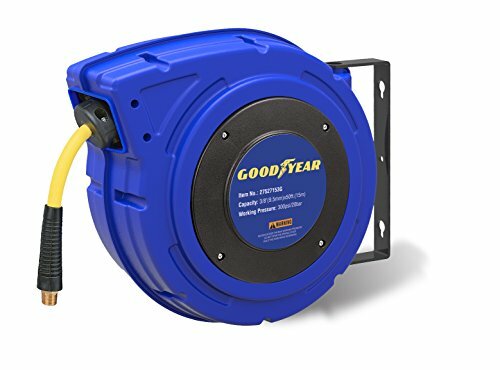 Goodyear 27527153G Enclosed Retractable Air Compressor/Water Hose Reel with 3/8 in. x 50 ft. Hybrid Polymer Hose, Max. 300PSI, Intradin China (Shanghai) Ltd. If you are looking for a kink free air hose reel, the ReelWorks 27807153A makes a great choice for a number of reasons. First, it comes with a durable construction that is made of impact resistant polypropylene making it extremely lightweight for easy mounting. The air hose reel comes with an automatic hose guiding system that automatically rewinds the 50 ft hose. It’s a multipurpose air hose that can be used with water or air compressors. In terms of endurance, this air hose comes with a latching mechanism not to mention a polypropylene construct for more endurance. If you are a DIYer looking for a decent air hose to work with, you might love the fact that this air hose comes with a wide variety of functional features. Not only will you have an easy time mounting it up, it works well for other tasks if the reviews from other users are anything to go by. Lincoln Electric LNC 83753 has a spring powered automatic recoil that most DIYers will enjoy. It is a good air hose reel to go for if you need a fully enclosed product for your workshop. With an 8 position ratchet system, this air hose reel is not only built for heavy duty work, it also brings about the convenience of easy positioning which works great no matter the size of your workshop. It’s built with a heavy gauge steel not to mention a heavy-duty rubber hose for durability as well. You can easily attach it to the ceiling thanks to the slotted mounting base that it comes with. To make mounting easy, be sure to first install the ceiling joists then use the lag bolts to slide in the reel as you attach it. When it comes to performance, there are a couple of drawbacks you should know about with the Lincoln Electric LNC 83753. It has a fragile O-ring inside the hose that has been known to easily crack meaning you might end up with a hose that leaks air. However, you can simply make a replacement if this ever happens. All you have to do is make a trip to your hardware store. The good news is that it’s designed with a ratcheting system that lets you angle the hose in 8 different directions giving you flexibility and variety when it comes to mounting it. With a 300 PSI capacity and a rubber air hose that is 25 ft long, Goplus GP-101040140 offers one of the best values for money for DIYers on a budget. It comes with a locking ratchet mechanism that allows you to operate it in 8 different locking positions making it a suitable buy for any workshop. It’s also an all-weather air hose reel that can be mounted to the ceiling or even the floor for maximum flexibility. You don’t need to worry about wear and tear. This air hose reel is made with brass fittings that restrict awkward bending of the hose thus reducing wear and tear. When it comes to performance, the Goplus GP-101040140 might be a little disappointing because of its shorter hose at just 25 ft, however, you get a strong a darn sturdy air hose reel that is handy for your workshop. Besides, at its price range, the durability and functionality of this air hose reel provides are simply unbeatable. Air hose reels are incredible tools for keeping your workshop tidy organized and clean. After all, you don’t want anyone to trip and fall over the hose do you? Well in simple terms an air hose reel is a tool that helps you store and use your air hose in the most convenient way. With an air hose reel, your air hose will stay durable for long plus they come with retractable mechanisms that make work in the workshop much easier. How does an air hose reel work? It’s pretty straightforward. Even though different air hose reels come with different set of features, the mechanism behind them stays the same across the board. If you already have an air compressor, you will have to check the maximum PSI for your air hose reel to determine whether the two are compatible. The work of the air hose reel is basically to connect to the air compressor and pass the pressure from the air compressor to a tool such as an air ratchet. Using a rigid pipe and a lead in the hose, the air hose reel is able to connect the tool with the air compressor without any leakage for the best results. How to connect air hose reel? This is an easy one. Start by connecting the air hose from the air hose reel to the rigid pipe that leads to the air compressor. Depending on your set up, you can set up the air hose reel close to the air compressor or at a distance. Make sure you wrap the incoming air hose with a thread of sealing tape to prevent any chances of a leak. Do this for every other end of the air hose including the one attached to the tool. If you have your setup and connection ready, you can do another check for leakages by brushing each of the connections with soapy water. Any sign of bubbles forming might be a leakage you will have to deal with. So you have used an air hose reel for some heavy duty work at the workshop and you start to notice that the locking pawl is getting worn out. What to do? Well in most cases, you might have to replace it. A locking pawl with worn out teeth can cause problems during hose retraction, locking and slipping so here is how to go about replacing it. After you are done you can confirm if it works by pulling the hose out of the reel to check if it retracts smoothly. Can an air hose reel be used for water? Most definitely you can. Most air hose reels are made to be flexible for multiple uses. You can use them with oil, water or even use them in the winter or in the summer depending on the features available. All you need is the right transition fittings to connect the air hose reel to your water sprayer. The only drawback is that you won’t get as much volume of water out as you would with a regular water hose. So you have everything set up and all you need now is your air hose reel. If you are new to this, however, you might end up missing out on some important features that will help you get the best air hose reel. To be on the safe side, check out the following important features you need to consider before a purchase. Every other air hose reel comes with its own air pressure limit. Since most air hose reels are wound with built-in retractable hoses that make working with them easy, you will need to look at how much pressure the air hose reel can handle depending on the task at hand. If you are a DIYer with a workshop set up at home for small tasks, a 300 PSI will work just fine. On the other hand, a PSI above 300 might be a requirement if you plan to use your air hose reel for heavy duty tasks. This comes down to durability. The last thing you want is to have an air hose reel that is incapable of handling the elements. Gladly there are a variety of options that boast of protective coating to extend the life of the hose and give it endurance even in extreme weather conditions. Be sure to go with a protected metal air hose reels as they can serve you for the long term even if you mount them outside. This here is another important feature that you can determine based on how you plan to use the air hose reel. It can be frustrating when you have just bought your favorite air hose reel only to find out its hose length is insufficient for your needs. In some cases, you can easily solve this problem by heading out to your local hardware store and find an extension. Other times the only option will be to mount the air hose reel as close to the air compressor as possible. We recommend you go with a 50 feet long air hose to be on the safe side. While some air hose reels can be mounted to the floor, and others to the ceiling, the decision on where to mount your air hose reel pretty much depends on your preferences. Depending on your set up you might need to think about what position works best for you. Some even come with over 8 positions that give you options when it comes to mounting. You might need a hand when mounting the air hose reel but overall, go with a product that makes the work easy. Well, there you have it, folks. If you often work with your air compressor at home or in your workshop, having an air hose reel can be a huge plus to your overall productivity. No matter where you want to mount it, our buyer’s guide and list of the top products will help you along the way to make a good decision. We have looked at the best options in terms of budget, performance, and endurance to ensure you get an air hose reel that suits your needs.